When will there be a deep introduction of artificial intelligence and a complete base of all 3D structures? Professionals of deep learning, who won first place at Casp - say that they cooperate with the baker laboratory on this topic. When will there be a fundamental change? and then wiggle the result. If you want the opposite orientation, do as below instead. Hmm, it should be possible to accomplish what you want. In a symmetric dimer puzzle (with C2 symmetry), there are different ways to align the two chains with respect to the symmetric axis. For example, consider if you make a single long "megahelix" with the active copy. Then you should be able to align the symmetric megahelices in a parallel, head-to-head fashion (when the symmetric axis is parallel to the megahelix); or, you could align the helices in an anti-parallel, head-to-tail fashion (when the symmetric axis is perpindicular to the megahelix). I think you should be able to accomplish this by rotating the pieces with the Move tool (the purple arrows). Or, as jeff101 suggests, try banding the pieces that you would like to be adjacent (head-to-head, or head-to-tail). If that still isn't working, it's possible there is a software bug. In that case, some more feedback would be helpful. Maybe a screenshot with bands between the residues that you would like to be adjacent? I believe the issue here is that there are more ways of arranging the two chains than can be described by rotation about an axis: you need to be able to (possibly among other things) translate along that axis too. Sorry I'm having problems attaching an image (Ubuntu) but have scientist-shared a couple of solutions that I hope illustrate the problem. The names are symmetric dimer issue 1 and symmetric dimer issue 2. Aha, I see what you mean! Thank you for sharing! Below is a screenshot with one of your examples (I unfolded one of the helices to clarify where the symmetry axis is). What you'd like to do is not possible in the puzzle, and this is intended behavior. In this case, it sounds like you'd want to move the active subunit (right) slightly up, while moving the symmetric subunit (left) slightly down. Unfortunately, this operation would break the cyclic symmetry. This puzzle (Puzzle 1658) has C2 cyclic symmetry, which means that symmetric copy is rotated 180 degrees about the symmetric axis (in the screenshot, this axis runs vertically down the center of the screen). If we carried out the operation to satisfy your bands, then the symmetric copy would be rotated 180 degrees about the axis and translated along that axis. This would be a "helical symmetry" (or "screw symmetry"), which is distinctly different from C2 cyclic symmetry. Helical symmetry exists in biological proteins (e.g. see tubulin). But the helical symmetry usually means that copies can continue to assemble along the symmetry axis, so these proteins form fibers. For now, we are just interested in designing proteins with cyclic symmetry—but one day we may try helical symmetry in Foldit! Recently, some other members of the Baker lab designed protein fibers with helical symmetry (you can find a PDF of this paper on the Baker lab website). Have the foldit results produced anything interesting? Are the foldit results of any value in any way? Are you brewing up results in the lab ? In 2018 the Baker lab had two publications about the first successful denovo designs of beta barrel proteins using Rosetta. Foldit players have also submitted a variety of beta barrel designs: have any foldit barrels been successful in Rosetta testing? In symmetry puzzles there is a core existence filter ensuring that each monomer unit has an individual core. But there are some structures in PDB in which monomer units lack their own core or have only a small part involved in it (for example 5Z1O, 4S37 and 4OSD). 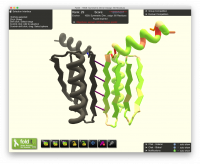 How do such proteins fold and is it feasible to try to design such structures in foldit?